We are offering two separate events in the months of October and November that are related to Buddhist Meditation techniques. Venerable Bikkhu (monk) Lp Sander is a Buddhist monk trained in Thailand. 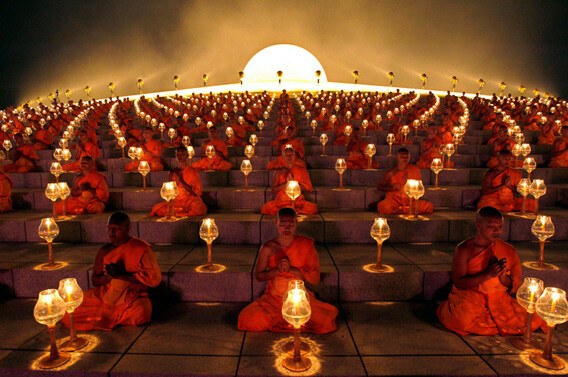 He will give an introduction to Dhammakaya meditation, a popular meditation technique practiced in Thailand and discovered by the well-known meditation master Luang Pu Wat Paknam. Ven. Sander will talk about how meditation can actually benefit your mind and how to integrate meditation in your daily life. This introductory session is open for beginners and experienced meditation practitioners alike. Demis Baldivieso will hold a 6 hour two parts workshop that will be dedicated to the practice and theory of Meditation. The practical part will include guided sitting meditations and also a walking meditation in the beautiful municipal garden of limassol that is next to the Vedanta Centre. We will learn simple ways to create and develop happiness within ourselves without depending on exterior conditions. We will share these feelings with other beings learn to handle effectively distractions that take our attention away. This workshop follows on nicely from the Meditation course that is being run at the Centre starting Friday 7th October. Demis Baldivieso has 13 years of experience practicing Meditation and over the last 3 years he has dedicated himself exclusively to meditation.